Until 2016, only four states and the District of Columbia in the United States retain the antiquated and unfair contributory negligence standard. In 2012, there were 564 crashes involving people riding bicycles in the District of Columbia and 458 people were injured. Many of those injured will receive little to no compensation to cover medical bills, lost wages and damages to their property. The system fails them at every level. The Bicycle and Motor Vehicle Collision Recovery Amendment Act of 2015 is a desperately needed change to DC’s antiquated and unfair negligence standard. Often referred as the “one percent” rule, contributory negligence bars a plaintiff’s recovery if they are greater than one percent at fault for the damages. The majority of states have abolished the contributory negligence standard in favor for a more fair comparative negligence scheme. The District of Columbia’s continued recognition of contributory negligence as a complete defense in a negligence action, when combined with the uneven enforcement of bicycle laws by the District’s police officers and lack of understanding of bicycle laws among the general public (i.e. potential jurors), makes recovery for damages suffered by cyclists injured in collisions with motor vehicles difficult and unpredictable. WABA works diligently to educate cyclists, police officers, and citizens on the proper application of bicycle laws. However misunderstandings still permeate and commonly lead to improper enforcement and conflict. To ensure fairness of recovery for injury, to promote fairness in the law, and to modernize the approach of the District of Columbia in the field, the Council should cease recognition of contributory negligence as a complete defense to a tort claim. Councilmember Mary Cheh (D-Ward 3) introduced the Bicycle and Motor Vehicle Collision Recovery Amendment Act of 2015 on January 6th, 2015. The bill was co-introduced by Councilmembers Charles Allen (Ward 6), Jack Evans (Ward 2), David Grosso (At-Large), Anita Bonds (At-Large) and co-sponsored by Yvette Alexander (Ward 7). Read the full proposed legislation on the DC Council website. On April 21, 2016, the Judiciary Committee voted 3-0 to move the Motor Vehicle Collision Recovery Act out of committee and recommended it for consideration by the full D.C. Council. Download a one-page fact sheet. 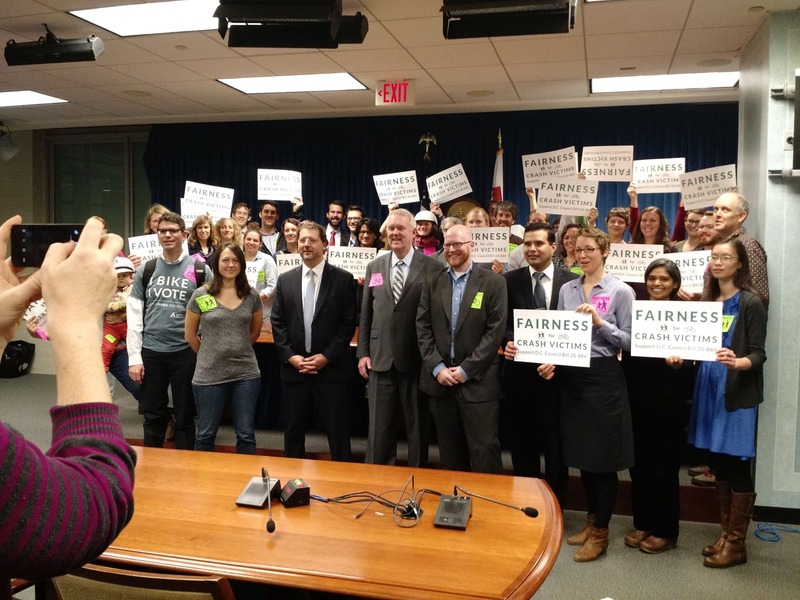 On Tuesday, July 12th, the full DC Council voted unanimously to move the bill forward. We expect the second reading and final passage sometime this fall. We will update as we have more details. The Washington Area Bicyclist Association has prepared a briefing memorandum on the issue of contributory negligence. Please contact WABA Advocacy Director Tamara Evans at tamara.evans@waba.org or 202-518-0524 x212.